Dr. Matthews grew up in Paris, Texas, and earned her B.S. and Ph.D. degrees from Baylor University. From 1998-2000 she was employed as an engineer at Raytheon Aircraft Integrations Systems, where her main project was vibroacoustics analysis for NASA’s Stratospheric Observatory for Infrared Astronomy (SOFIA). In 2000 she returned to Baylor as a lecturer in the Physics Department and Baylor Interdisciplinary Core and Senior Research Scientist with CASPER, and is now a Professor of Physics and Associate Director of CASPER. Dr. Matthews is engaged in both theoretical and experimental research in dusty plasmas. Dusty plasmas, which consist of micron-sized solid grains immersed in ionized gas, are found in many astrophysical environments. 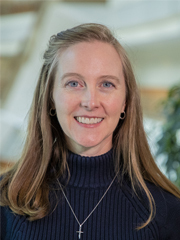 Her research interests include the early stages of planet formation involving the charging and coagulation of dust, planetary ring dynamics, and the self-organization of laboratory dusty plasmas into dust crystals, Coulomb balls, and dust strings. Another area of interest is hypervelocity impact studies, in relation to designing shielding material and dust detectors for space missions. NSF/DOE: Dynamics of strongly coupled complex plasma systems with directed ion flow (August 2017 - July 2020), $230,000. NSF/NASA (Co-PI): PK-4: Self-ordering of interacting complex plasma particles in microgravity (June 2017 - May 2021), $540,000. NSF/DOE: Collaborative Research: Fundamental Charging Processes of Dust in Complex Plasmas (September 2014- August 2017), $345,000. NSF CAREER: Charging and Coagulation of Dust Grains In Astrophysical and Laboratory Environments (June 2009- May 2015), $436,658. S.-Z. Jiang, X.-N. Hou, J. Kong, L. S. Matthews, T. W. Hyde, F. Huang, and M.-J. Wang, Chinese Physics Letters, 35(12), 125201, 2018.
with Michael Dropmann, Mudi Chen, Hannah Sabo, Rene Laufer, Georg Herdrich and Lorin Matthews, Diagnostics of dust in plasmas - laboratory, space, and fusion plasmas, The Journal of Plasma Physics, 82, 615820401, 2016.
with Michael Dropmann, Andreas Knapp, Christoph Eichhorn, Stefan Lohle, Rene Laufer, Georg Herdrich, Lorin Matthews, Stefanos Fasoulas and Hans-Peter Roser, Transactions of the Japan Society for Aeronautical and Space Sciences, Aerospace Technology Japan, Vol. 14, No. ists30, 21-26, 2016.